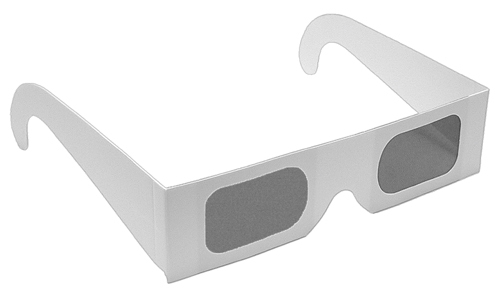 Preprinted Eclipse Glasses - Safe Solar Viewers in our convenient retail displays. ISO and CE Certified Safe. Always in stock and ready to ship. 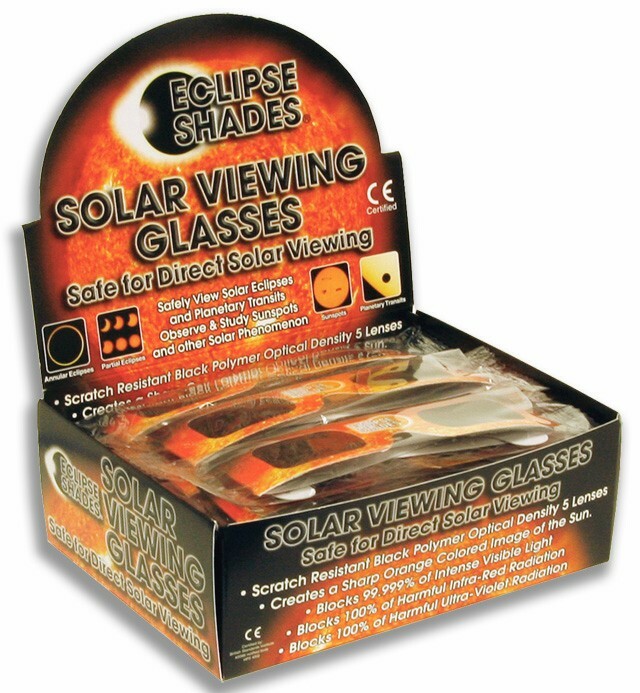 Eclipse Shades® - Safe Solar Glasses now in a convenient retail display box. 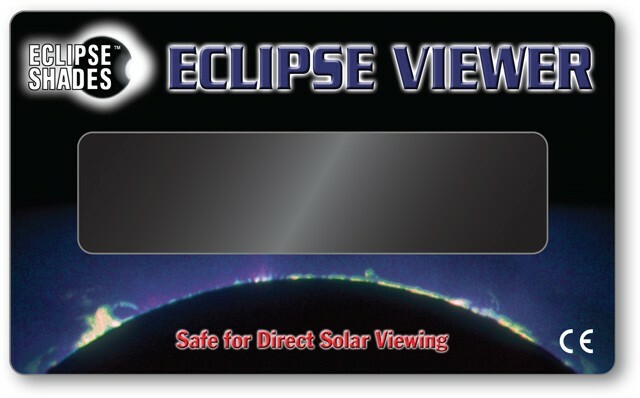 Absolutely safe for direct solar viewing of solar eclipses, sun spots and other solar phenomenon. All of our solar viewing materials are optical density 5 or greater and are "CE" certified which meets the transmission requirements of scale 12-16 of EN 169/1992. Lenses are made of our exclusive scratch resistant optical density 5, "Black Polymer" material. 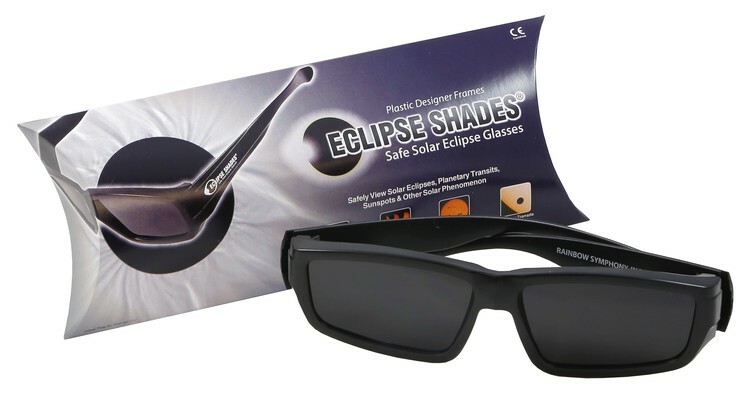 Eclipse Shades filter out 100% of harmful ultra-violet, 100% of harmful infrared, and 99.999% of intense visible light. These premium filters create a sharper ORANGE colored image of the sun. 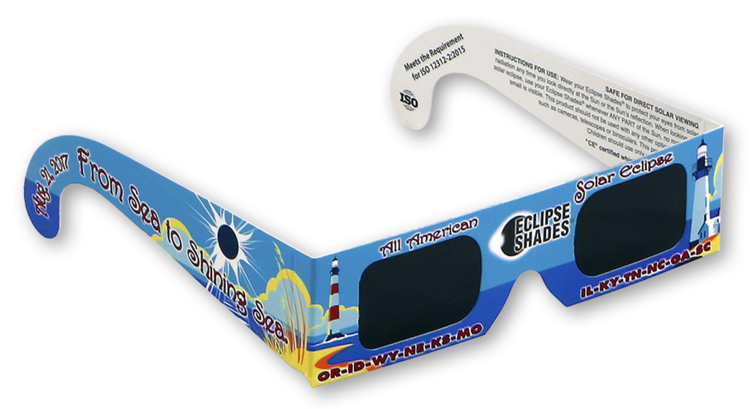 The backside is printed with safety information (English translation only) Pop-up Display Box contains 50 Eclipse Shades- Safe Solar viewers. Individually folded and wrapped. 12+ Boxes is our case price. Please ask about additional discounts for multiple cases quantities. 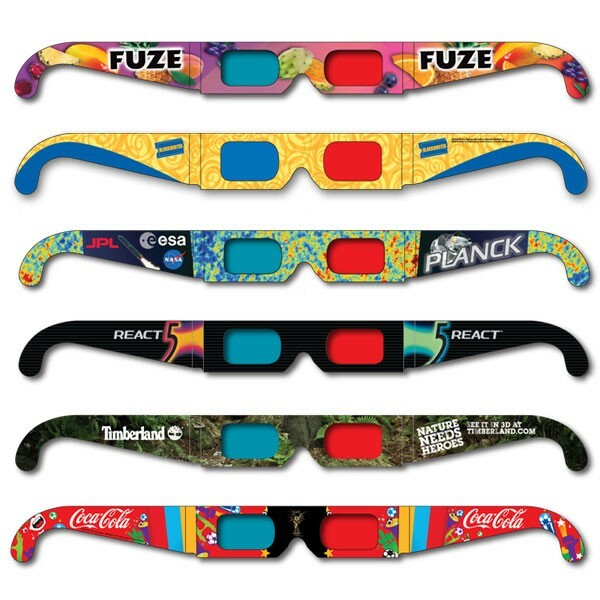 All of our stock Eclipse Glasses backgrounds can be custom printed with your logo and information. Please refer to part #07305 for pricing, information and design templates. 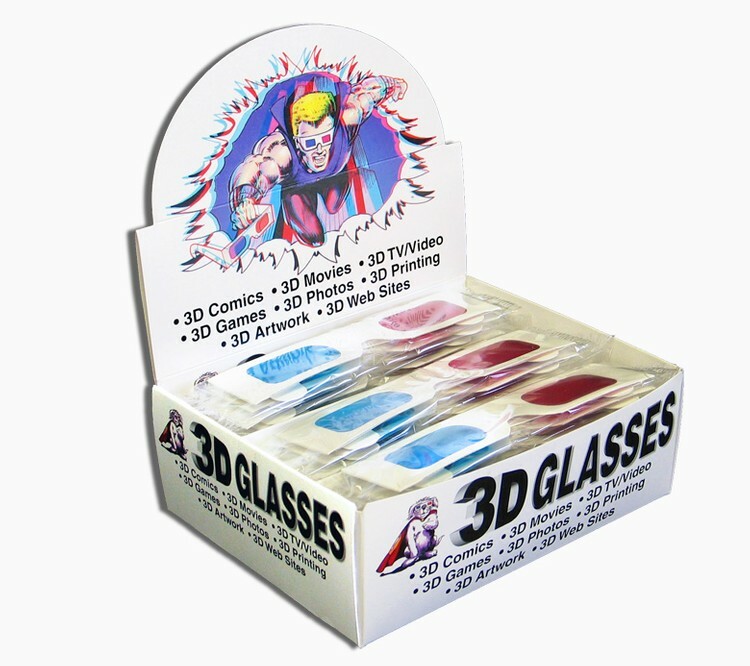 Custom printed Mini Hand Held anaglyph 3D glasses that are used for 3D printing and art or for viewing 3D Comics, Movies and TV. You can add virtual reality to your web site. 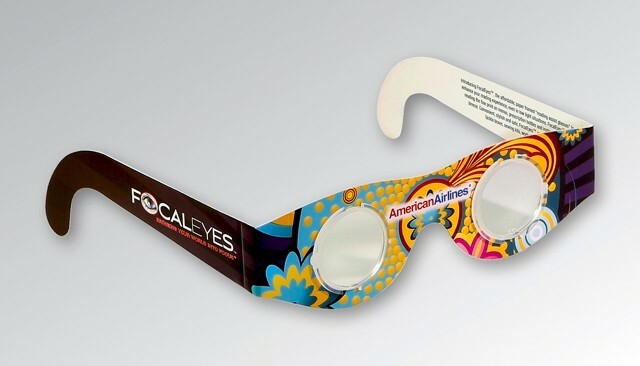 These 3D glasses offer an affordable visual enhancement or make your next Corporate Power Point presentation or Direct Mail campaign in 3D. 3D Glasses with Red/Cyan Lenses are used for viewing 3D Movies, print, magazines, comic books, Anaglyph 3D photos on the internet and publications. 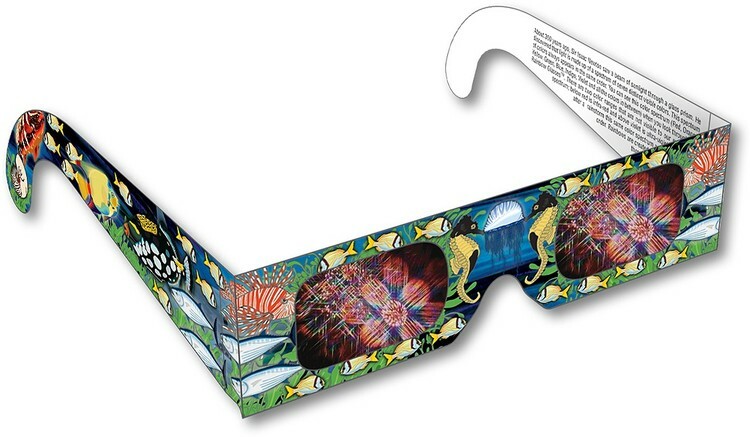 Preprinted Rainbow Glasses with Tropical Fish designs. Always in stock and ready to ship. Rainbow Glasses are the perfect item for education and the study of light and color. Backside printed with color information. Holographic diffraction grating lenses break light into rainbow starbursts. For viewing 4th of July Fireworks Displays, Laser Light Shows and Holiday Celebrations. All of our stock Fireworks Glasses and Rainbow Glasses backgrounds can be custom printed with your logo and information. Please refer to part #01302 and #01302-1 for pricing, information and design templates. Custom Hand held anaglyph 3D glasses for viewing 3D comics and movies, TV and games or 3D printing and art. Add virtual reality to your web site. 3D glasses offer an affordable visual enhancement. 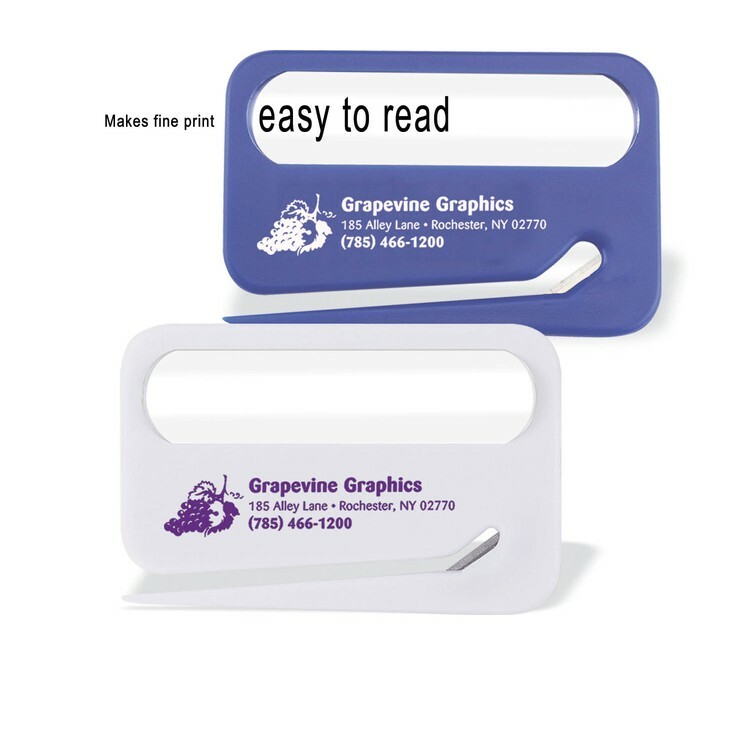 Make your next Direct Mail campaign or corporate Power Point presentation in 3D. 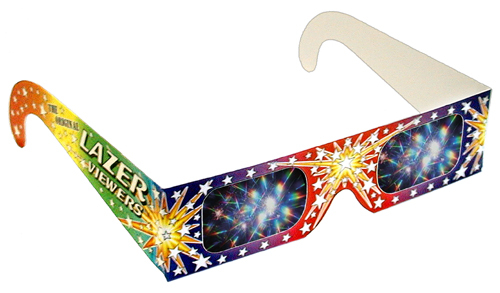 Preprinted Rainbow Blend Lazer Viewers Fireworks Glasses. Always in stock and ready to ship. Ideal for Music Festivals, 4th of July Fireworks Shows, Holiday Celebrations, City and Streetlights and even the Moon and Stars. Great in the classroom when a quality diffraction grating is needed for the study of light and color. Experiment and have fun! View your world in bright new colors. The rainbow starbursts will amaze you! All of our stock Fireworks Glasses and Rainbow Glasses backgrounds can be custom printed with your logo and information. Please refer to part #01302 for pricing, information and design templates. 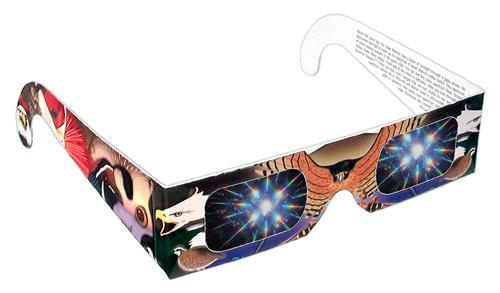 Preprinted Rainbow Glasses with Birds of Prey design. Always in stock and ready to ship. Rainbow Glasses are the perfect item for education and the study of light and color. Backside printed with color information. Holographic diffraction grating lenses break light into rainbow starbursts. For viewing 4th of July Fireworks Displays, Laser Light Shows and Holiday Celebrations. Custom artwork can be printed on any of our stock backgrounds. 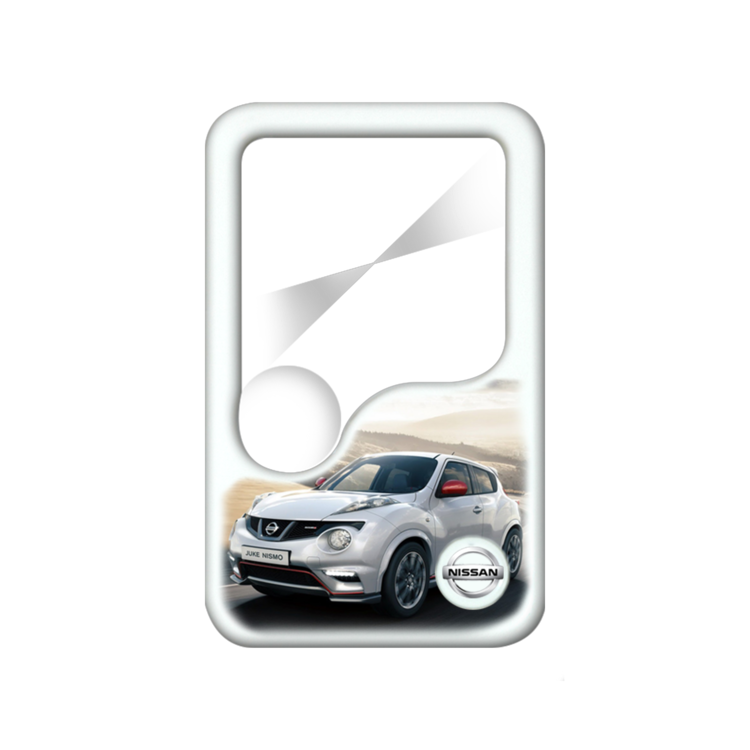 All of our stock designed backgrounds can be custom printed with your logo and information. Please refer to part #01302 and #01302-1 for pricing, information and design templates. 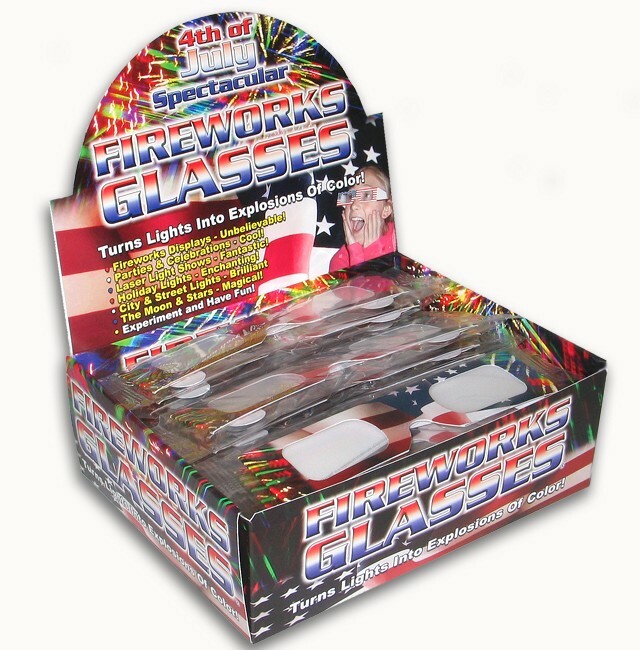 Preprinted American Flag #2 Fireworks Glasses in our convenient retail displays. Always in stock and ready to ship. Ideal for Music Festivals, 4th of July Fireworks Shows, Holiday Celebrations, City and Streetlights and even the Moon and Stars. Great in the classroom when a quality diffraction grating is needed for the study of light and color. Experiment and have fun! View your world in bright new colors. The rainbow starbursts will amaze you! Pop-up Display Box contains 50 American Flag #2 Fireworks Glasses. Glasses are individually folded and wrapped and printed with UPC codes. 12+ Boxes is our case price. Please ask about additional discounts for multiple cases quantities. All of our stock Fireworks Glasses and Rainbow Glasses backgrounds can be custom printed with your logo and information. Please refer to part #01302 for pricing, information and design templates. Decoder / Secret Reveal Glasses - Special lenses of Red / Red or Blue /Blue for decoding secret messages. Great for sweepstakes, contests and special prize giveaways. We match ink colors, lens colors and paper stock, to produce the best possible secret reveal images. We will supply the digital Decoder files to your printer, ready for production. 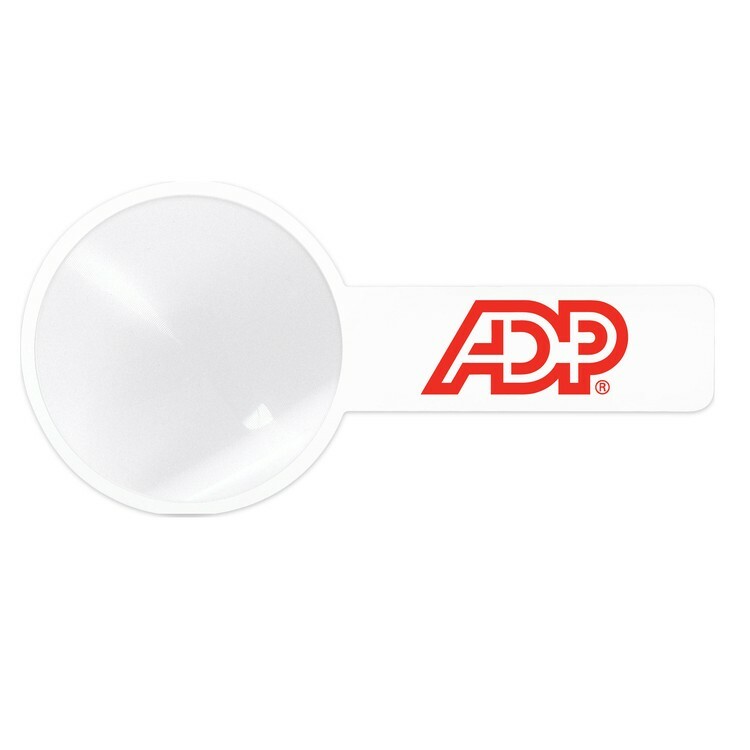 You'll be the winner when you punch up your promotion with our Decoder/Secret Reveal Glasses. 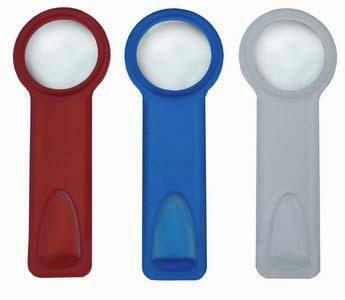 All of our Decoder / Secret Reveal Glasses can be custom printed with your logo and information. Please refer to part #02302 and #02302-1 for pricing, information and design templates. RainbowDepth™ Color Shift 3D Glasses are the newest addition to our ever expanding line of 3D glasses. RainbowDepth™ 3D glasses work by shifting colors in the spectrum. Red being pulled closest to you and deep blue being pushed to the background. The resulting contrast of the shifting spectrum of colors gives you a dynamic sense of 3D. Original art can be coded in the RainbowDepth™ method although there are many situations where the natural scene shows up in 3D through the glasses. Colors against a scene like neon fluorescent black light paints pop with a striking 3D effect. Make your next Halloween Haunted House a RainbowDepth 3D extravaganza with fluorescent black light paints. Laser light shows, printed materials, computer graphics and specific color arrangements shown on television in movies, on video and hi definition blu-ray create an outstanding array of color effects. Create eye-popping effects with crayons, markers and sidewalk chalk. 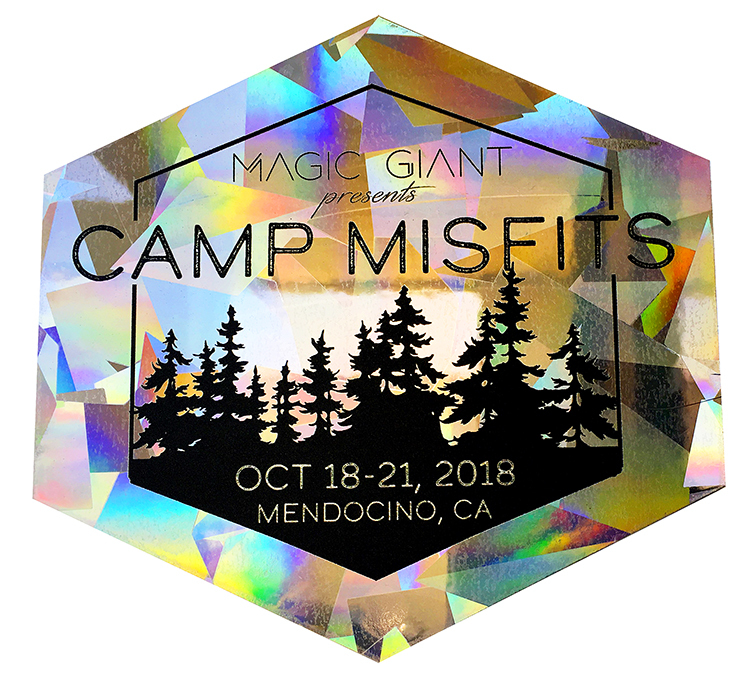 Of course we will also manufacture your custom printed glasses frames to accommodate your next Spooky House, promotional, marketing and advertising campaign. All of our RainbowDepth 3D Glasses can be custom printed with your logo and information. Please refer to part #01710 for pricing, information and design templates. 4X magnification. Fresnel lens. 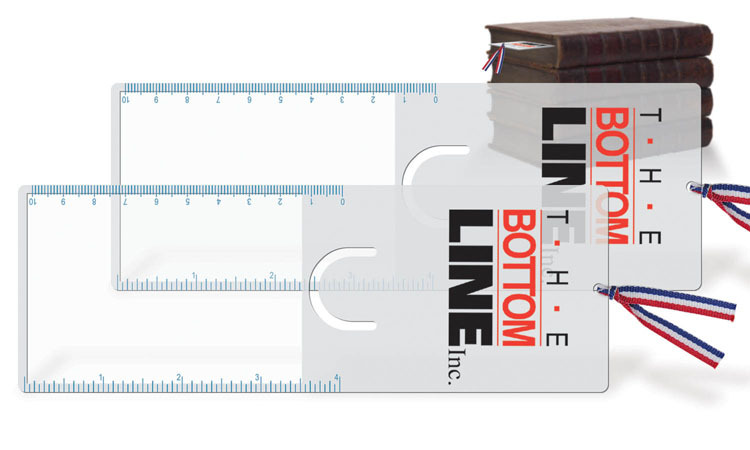 Side ruler markings in inches and centimeters. 3X magnification. Fresnel lens. Large 2.5” diameter surface. 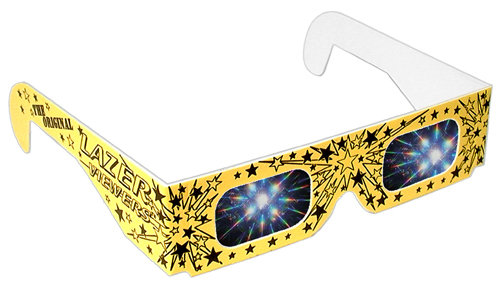 Preprinted Assorted Neon Lazer Viewers Fireworks Glasses. Always in stock and ready to ship. Ideal for Music Festivals, 4th of July Fireworks Shows, Holiday Celebrations, City and Streetlights and even the Moon and Stars. Great in the classroom when a quality diffraction grating is needed for the study of light and color. Experiment and have fun! View your world in bright new colors. The rainbow starbursts will amaze you! All of our stock backgrounds can be custom printed with your logo and information. Please refer to part #01301 for pricing, information and design templates. Polarized 3D Glasses. Always in stock and ready to ship. Linear Polarizing lenses specially cut at 45/135 or 0/90 degree angles. For viewing stereo pairs projected through left and right polarizing filters. Polarized 3D glasses are used primarily for 3D movies, live concerts, 3D ride simulators, location based entertainment centers, multimedia displays, corporate presentations and special 3-D movies. 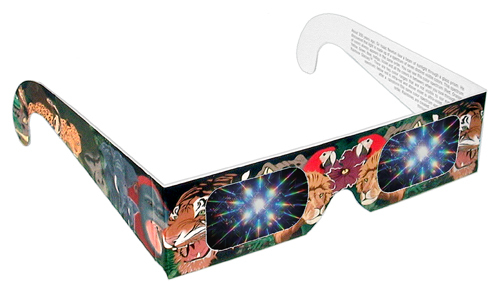 Preprinted Rainbow Glasses with African Animal design. Always in stock and ready to ship. Rainbow Glasses are the perfect item for education and the study of light and color. Backside printed with color information. Holographic diffraction grating lenses break light into rainbow starbursts. For viewing 4th of July Fireworks Displays, Laser Light Shows and Holiday Celebrations. All of our stock Fireworks Glasses and Rainbow Glasses backgrounds can be custom printed with your logo and information. Please refer to part #01302 and #01302-1 for pricing, information and design templates. 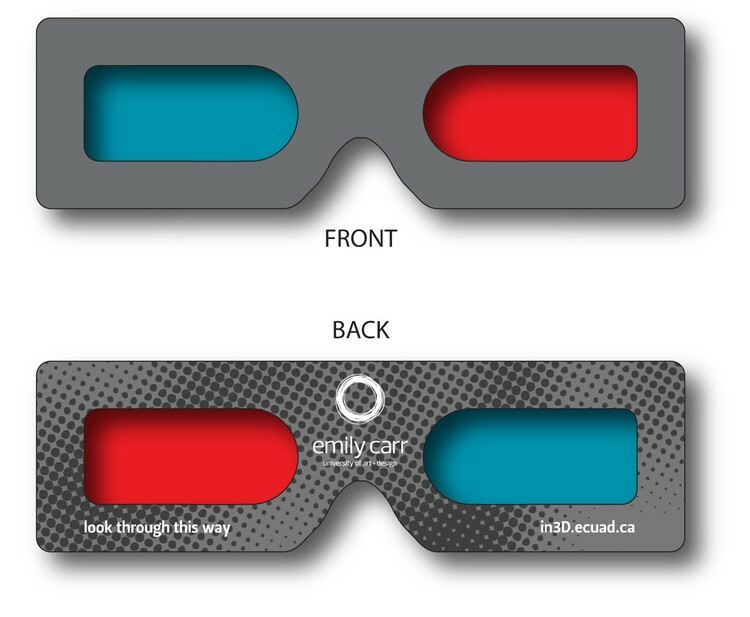 Stock 3D Glasses with Red/Cyan lenses in our convenient retail displays. Always in stock and ready to ship. 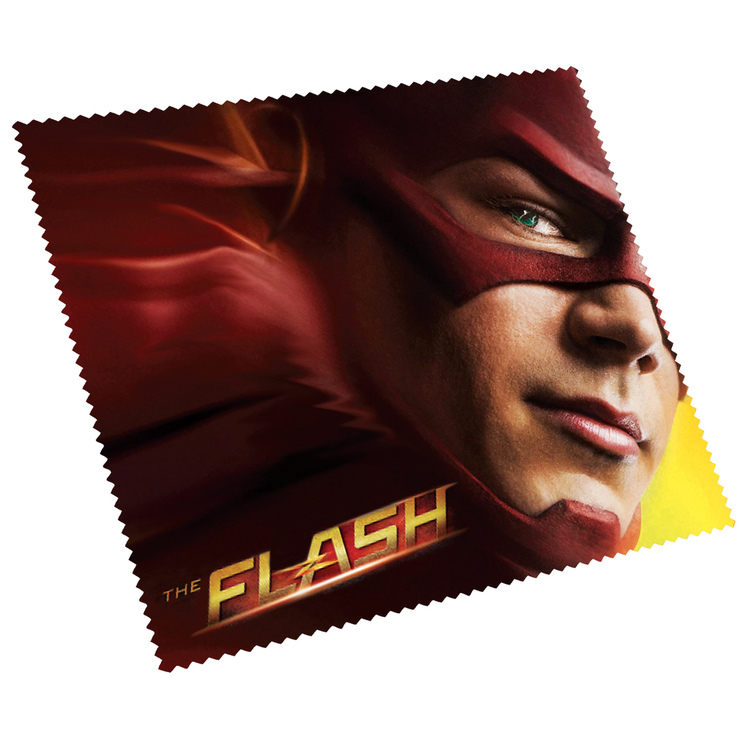 Anaglyph Red/Cyan lenses are used for viewing 3D Comics and Movies, TV and Games, 3D Printing and Art. 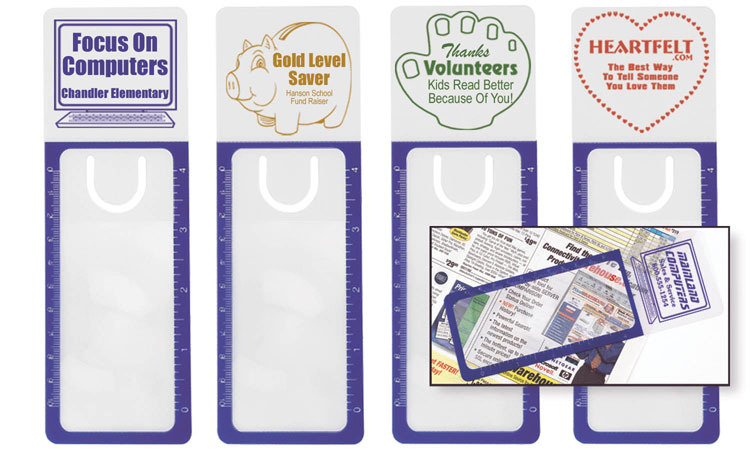 Make your next Direct Mail campaign or Corporate Power Point presentation in 3D.! 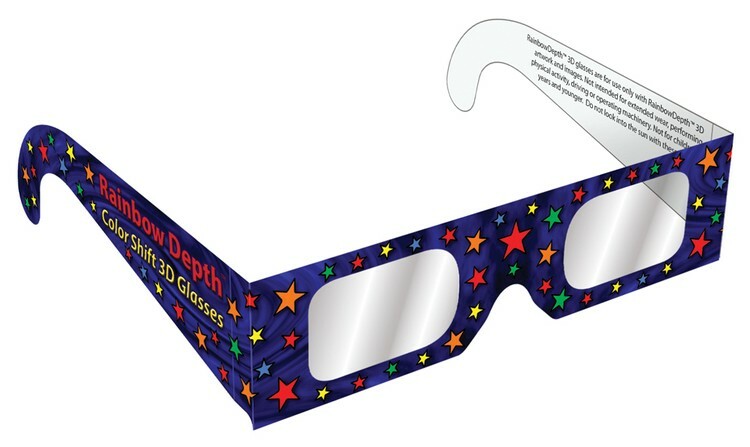 Pop-up Display Box contains 50 3D Glasses with Red/Cyan Lenses. Glasses are individually folded and wrapped and printed with UPC codes. 12+ Boxes is our case price. Please ask about additional discounts for multiple cases quantities. 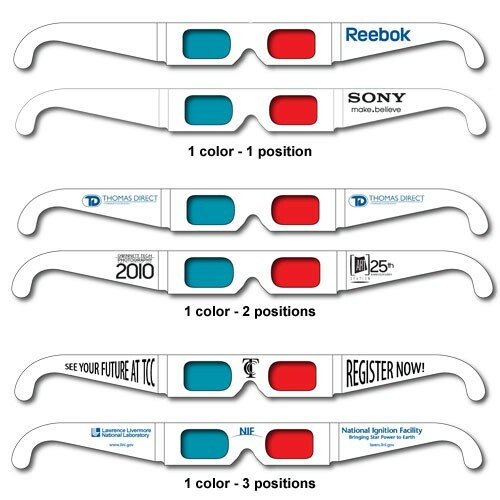 All of our stock 3D Glasses backgrounds can be custom printed with your logo and information. Please refer to part #03312 for pricing, information and design templates.